This level has medium difficulty. 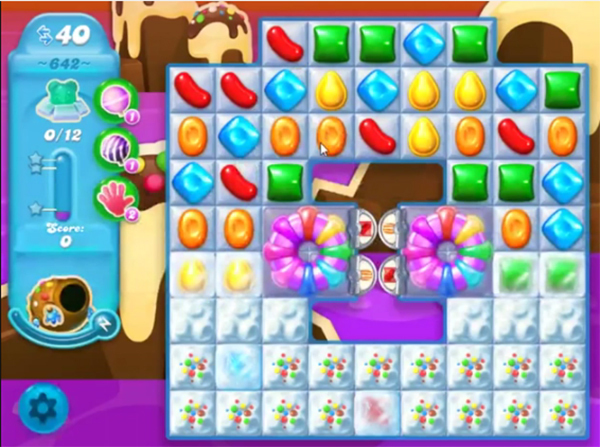 For this level try to play from where more candies are available to play where more candies are available to play. Make special candy and combine special candies with each other to break more snow to find the bears. HORRIBLE LEVEL! !as usual not enough moves, no matter how many boosters you use, you’re not going to get it, so save them. You can’t make any good matches. SC will ALWAYS take your next best move on the board if you use a fish, and even if you clear the wheels, you MIGHT get a few good boosters, IF you can make moves to drop them. Another waste of time level, NOT fun, so play sparingly. This is a wait for a lucky board level!! I’M DONE!! i used ALL my power ups and still couldn’t clear the board. Such a disappointing game!! This level has 35 moves. I agree with Cj! This video shows 40 moves when in reality there are only 35. A real gyp! HARD level…should be ludicrous level! 35 moves..can not do it!